Keane and the Galaxy on the brink of history as they bid for fifth MLS title. Keane and his Galaxy team-mates celebrate on Sunday night. 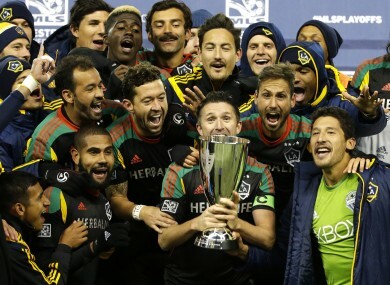 ROBBIE KEANE CAPTAINED the LA Galaxy to another Western Conference title on Sunday night. Juninho’s second-half strike proved vital as the Galaxy lost 2-1 against the Seattle Sounders but won on away goals after a 2-2 aggregate draw. Bruce Arena’s side can now become the first franchise to win five MLS cups when they host Eastern Conference champs the New England Revolution this coming Sunday. A win would also complete a hat-trick for Keane who won championships stateside in both 2011 and 2012, and is fancied to be named the league’s Most Valuable Player (MVP) this season. LA’s first-leg lead was wiped out when Brad Evans scored in the 26th minute and then Clint Dempsey’s shot squirmed under goalkeeper Jaime Penedo to give the Sounders the lead on aggregate. But Juninho’s perfectly-placed strike nine minutes into the second half clinched an eighth conference title and set up a showdown with the Revolution. – Click here if video does not play in the app. Email “Robbie Keane captains LA Galaxy to conference title and into MLS final”. Feedback on “Robbie Keane captains LA Galaxy to conference title and into MLS final”.